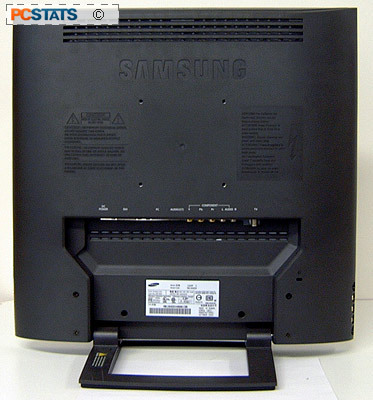 Samsung are a large enough company, and the DVI port prevalent enough in computers these days, that it really ought to be included with monitors that support the standard. The logic is lost on me, especially considering the remote even comes with a pair of AAA batteries! Power is supplied to the Syncmaster 192MP via a DC connection - meaning a power brick with full 6' length power cable rests on the floor down below out of sight and mind. If the 192MP is wall mounted, or placed on an armature, the thin DC power cable is a lot easier to hide than a standard power cable. The other multimedia ports are an audio input, a set of component (Y, Pb, Pr) input jacks and associated left / right audio jacks, and lastly the coaxial cable connector for TV. The entire display is well balanced on the stand, which does not feature any type of swivel, and nor does it need one. The entire unit weighs 13.lbs, making it light enough to move on its own from side to side. The stand tilts backwards a few degrees to accommodate different user viewing preferences.